Marine Corps Systems Command is enhancing Marines’ ability to communicate in the air with a new iteration of Networking On-the-Move, or NOTM. In May 2015, the first NOTM-Airborne Increment I (also known as the Hatch-Mounted Satellite Communication Antenna System) was fielded to Special Purpose Marine Air-Ground Task Forces. It provides embarked ground personnel real-time access to networks during airborne operations aboard KC-130 aircraft. The capability enabled mission commanders to conduct en route planning and execution across several types of missions. Ground communications specialist Marines train on configuring and operating the Networking On-the-Move-Airborne Increment II. 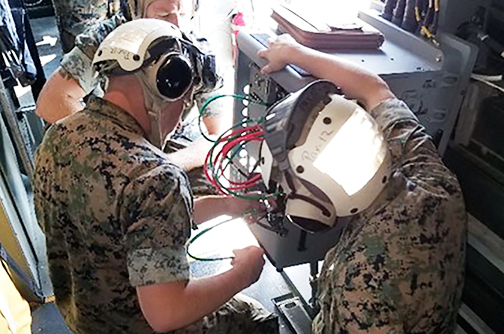 This month, Marine Corps Systems Command fielded the first NOTM-A Inc. II System to the 22nd Marine Expeditionary Unit to enhance their ability to communicate in the air. Photo is courtesy of the U.S. Marine Corps — Chris Wagner. Building upon that success, the Marine Corps directed MCSC to build the NOTM-Airborne Increment II System, or NOTM-A Inc. II, and install it on the MV-22 Osprey tiltrotor aircraft. In June, the first of the systems was fielded to the 22nd Marine Expeditionary Unit. As a joint effort, Naval Air Systems Command and MCSC had to modify the Osprey in order for a NOTM-A Inc. II System to be installed and operated. This involved modifications such as replacing the rear overhead hatch, installing a SATCOM radome, and installing system interface cables. Mission ready, the system is capable of providing communications access for up to five users, including networks, voice, email, video and text. "This system provides accurate and up-to-date en route information, which is critical for mission accomplishment and force protection," said Lt. Col. Devin Licklider, program manager of Command and Control Systems, PfM CES, MCSC. "If the situation on the ground changes, we can get updates to the Common Operating Picture, from reconnaissance assets to the commander enabling mission changes while en route." Testing took place November through December of 2017 at Naval Air Station, Patuxent River, Maryland. This included extensive ground testing to ensure the system did not interfere with other aircraft systems, and Marines practiced installing and removing NOTM from the MV-22, Wagner said. Additionally, all components were subjected to numerous environmental, electromagnetic interference and safety testing to ensure they did not smoke, burn or explode. Once the system is configured, it’s easy to use because all Marines have to do is turn it on, wait about 10 minutes, and they are on the network, program officials said. “During testing, Marines were very pleased with the ability to access communications networks while in the air,” said Wagner. Additional testing will take place at Patuxent River later this year,and users will link up the Inc. II System with other C2 systems after it is installed on the MV-22 Osprey. There are also plans to add a secure tactical WiFi capability to replace the use of cables on the aircraft, which has never been done before, Wagner said. Marine Expeditionary Forces I and II will receive the NOTM-A Inc. II System when fielding continues in 2019. "This capability will absolutely save lives," said Licklider. "It offers Marines a reliable command and control tool for long-range missions to ensure they can reduce unknown variables, utilize alternate landing zones or abort missions if necessary."